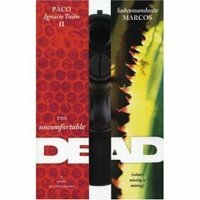 I read several of Paco Ignacio Taibo's earlier crime novels (featuring the sometime detective Hector Belascoaran Shayne) some years ago and then lost interest. Taibo's detective stories aren't so much "noir" as satirical and magic-realist. The author is using the detective form to comment on politics and contemporary life in Mexico and beyond. But I was curious about his most recent crime story since he co-wrote it in alternating chapters with a real-life revolutionary, Subcomandante Marcos of the Zapatistas still fighting in the Chiapas region of Mexico. Marcos's chapters are suprisingly comic (as well as tendentious and political, more what you would expect). Taibo's chapters are as comic as we might expect, but also political and critical. Both halves are "metafiction," drawing in authors and characters from beyond the novel's world--particularly both Spanish writer Manual Vazquez Montalban and his Barcelona detective Pepe Carvalho (Vazquez Montalban, also a poltical novelist using the crime genre satirically, died recently and The Uncomfortable Dead is in part an obituary or hommage). As metafiction, magic realism, politics, and satire, this "novel by four hands" is not that satisfactory as noir fiction, but its politics are actually very much in line with noir: the neo-liberal bad guys of The Uncomfortable Dead are the same as the evil developers of Chinatown and numerous noir novels and films. The novel ends not with a victory over evil but with a partial revenge against the evil that the authors see as permeating society as a whole. If a couple of bad guys are removed from action, it's only a drop in the ocean of evil. Belascoaran turns from murdering one bad guy to playing head games (or subversion, perhaps) with numerous unidentified "Moraleses", Morales being the protean bad guy or guys of this book. I can't say I'm motivated to go back and catch up with the other tales of Belascoaran (though in spite of its tendentiousness I enjoyed this book), but I am motivated to go back to the novels of Vazquez Montalban (who also inspired the Montalbano novels set in Sicily)--more on that series later. "I am motivated to go back to the novels of Vazquez Montalban (who also inspired the Montalbano novels set in Sicily)--more on that series later." Montalbano does indeed read Montalban, but Camilleri said the character was based on his father. The literary inspiration is surely the work of Leonardo Sciascia, although the style is very different. Hi: thanks for the response, Uriah. But the name "Montalbano" is an obvious and admitted tribute to Vazquez Montalban--but the character doesn't have anything but the love of food and a leftist-humanitarian mindset in common with the Spanish private detective. Montalbano may well be modeled on Camilleri's father--and there is an obvious connection with Sciascia, but a limited one, I think. Camilleri put serious thoughts a la Sciascia into h is cop's mind and speech from time to time, but Camilleri's books are much lighter. They do share a Sicilian context and a brevity, plus a seriousness about the political and social milieu--but Sciascia is more of a documentarian, in a philosophical manner, rather than an entertainer, which is primarily what Camilleri is (though there's nothing negative in that assessment). I agree Glenn, Camilleri is certainly an entertainer. But I do think he gets over his message effectively and in a less bleak manner than Sciascia. I enjoy Sciascia but there are not many laughs in those of his books I have read. I’d say Camilleri takes something from Simenon, too, at least in The Smell of the Night, and not just because he has Salvo Montalbano try and fail to read a Simenon novel throughout the book. And, as light and entertaining as his books can be, there is a certain starkness to some of his scenes that reminds me a bit of Sciascia. As a political crime novelist, Sciascia works better for me than the rest because he avoids polemics. Paco Ignacio Taibo, on the other hand, hits the reader over the head with speeches, which seems strange, because he can write a wonderfully lyrical passage, as in the opening chapter of Some Clouds. On the other hand, I may be too obtuse to get some of the politics. I’ve read three of his novels, and it never occurred to me until some essayist noted it that Hector Belascoaran Shayne’s cramped office, as well as the professions of some of his office mates – plumber, sewage engineer – may themselves be political commentaries.